SS 310H Tubes, 310H Stainless Steel Pipes, SS UNS S31009 Pipes, ASTM A312 Stainless Steel UNS S31009 Seamless Pipes & Welded Tubes Supplier & Exporter in India. We are a leader in Indian markets for many years in the field of manufacturing & exporting of Stainless Steel 310H Pipes & tubes. SS 310H Pipes and SS 310H Tubes are being used in the most significant engineering purposes and as well in certain functions in the automotive segment. Our SS 310H Pipes and Tubes are quite appropriate for flanging, bending, and parallel forming processes, and also for fusion welding. The Pipes & Tubes manufactured from Grade 310 H have excellent toughness, even down to cryogenic temperatures, although other grades are normally used in this environment. Our products synonymous with high quality manufacturing, precision machining and unparalleled dedication to quality excellence, we have steadily maintained our position in the fore front of oil industry. We procure top quality stainless steel 310H pipes & tubes are available in seamless, ERW, welded and fabricated pipes. 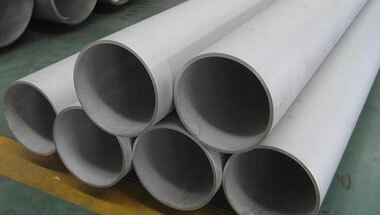 Stainless Steel 310H Seamless IBR Pipes and Tubes are used for dissimilar application for a wide-ranging of industries such as natural gas, oil or water transport. Our 310H IBR Pipes and Tubes are accessible in diverse size, specification and thickness as per the clients’ needs. Our Stainless steel 310h product includes tubes and pipes, SS 310H Pipes, SS 310H Tubes, Stainless 310H Seamless Pipes & Tubes etc. These products are available at best possible prices which is another important feature exhibited by our products range. Stainless Steel 310H ERW Pipes, SS 310H Seamless Tubes, Steel 310H Welded Pipes, Stainless Steel 310H EFW Tubes, Stainless ASTM A213 310H Seamless Pipes Manufacturer in India. Azerbaijan, Argentina, Peru, Morocco, Vietnam, Kazakhstan, UAE, Democratic Republic of the Congo, Colombia, UK, Tunisia, Brazil, Ghana, Sudan, Malaysia, Turkey, United States, Africa, Egypt, Uganda, Kuwait, Cameroon, Russia, Jordan, Italy, Israel, Thailand (Bangkok), Trinidad and Tobago, Saudi Arabia, Mexico, London, Iraq, Iran, Australia, Dubai, South Africa, Houston, Nigeria, New Zealand, Ethiopa, Venezuela, Sri Lanka, Bahrain, Germany, Mozambique, Chine, Algeria, Canada, Indonesia, Angola. Abu Dhabi, Colombo, Casablanca, Ouagadougou, Sharm el-Sheikh, Brazzaville, Durban, Luanda, Khartoum, Cairo, Addis Ababa, Benin, Tripoli, Fez, Aqaba, Douala, Maputo, Kinshasa, Lusaka, Alexandria, Conakry, Hong Kong, Dakar, Mbuji-Mayi, Doha, Harare, Johannesburg, Port Elizabeth, Bethlehem, Abidjan, Riyadh, Byblos, Subra al-Haymah, Omdurman, Kampala, Mogadishu, New York, Algiers, Bamako, Lagos, Istanbul, Kano, Giza, Lubumbashi, Kaduna, Maiduguri, Cape Town, Cairo, Bulawayo, Manama, Soweto, Accra, Rabat, Tehran, Ibadan, Muscat, Dar es Salaam, Yaoundé, Jeddah, Tel Aviv, Kolwezi, Data from the UN, Beirut, Port Harcourt, Amman, Jerusalem, Mecca, Dammam, Nairobi, Singapore, Dubai, Freetown, Zaria, Pretoria, Antananarivo.